It is with deep sadness that Kat announces the peaceful passing of her beloved companion and best friend, James, on Friday, January 18, 2019, at the age of 62, at their home in Whitemud Falls, MB. James will be lovingly remembered by his wife Kat, one son, three stepsons, his mother, two sisters and his one brother. James loved many things in life. He and Kat were inseparable. 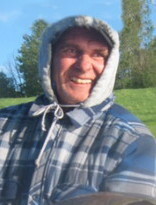 He was an avid fisherman, a great dad to his children and would play dad to their three dogs. He was the most dedicated employee one could ever ask for. The family would like to thank Dr. Mohammed for the care and compassion shown to James. A Celebration of Life will be held from 1:00 p.m. to 3:00 p.m. on Tuesday, February 5 at the Royal Canadian Legion Branch #43, 134 Marion Street, Winnipeg, MB. In lieu of flowers, donations may be made in James’ memory to Pancreatic Cancer Canada, 508-36 Eglinton Avenue W., Toronto, ON M4R 1A1. Our thoughts are with you, sincere condolences.